In our travels we've seen many things and done a lot with the kids. We do a ton of camping when we can, but I'm not sure how far we will be going this year with the gas prices being what they are. There aren't as many National Parks in our area, there are many out west however. 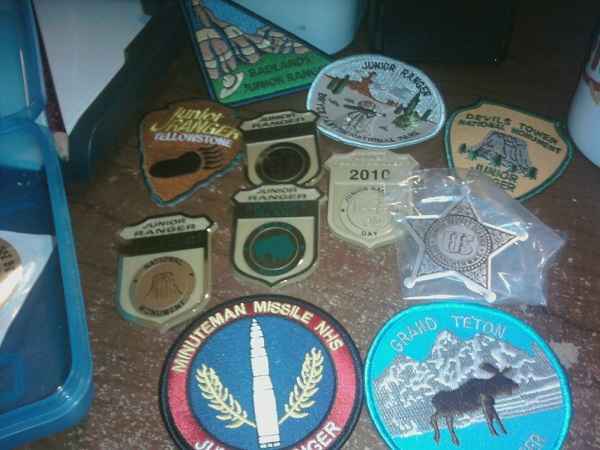 Some of the State Parks out west have badge or patches as well the kids can get. 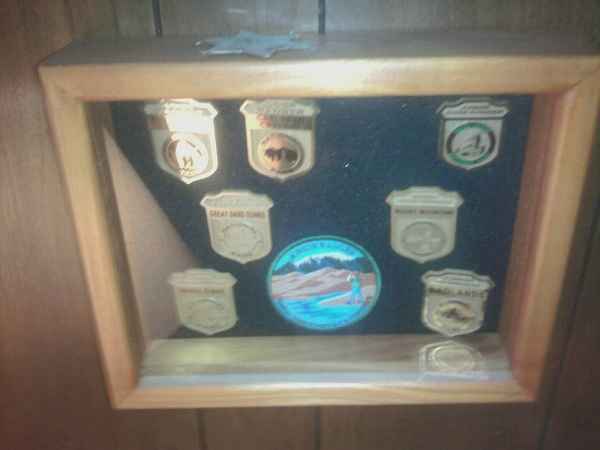 The kids have a great collection of National Parks Jr Ranger Badges and Patches collectibles. The first thing the kids ask when we pull into a National Park is, "When are we going to the Welcome Center to get our Jr Ranger Books". 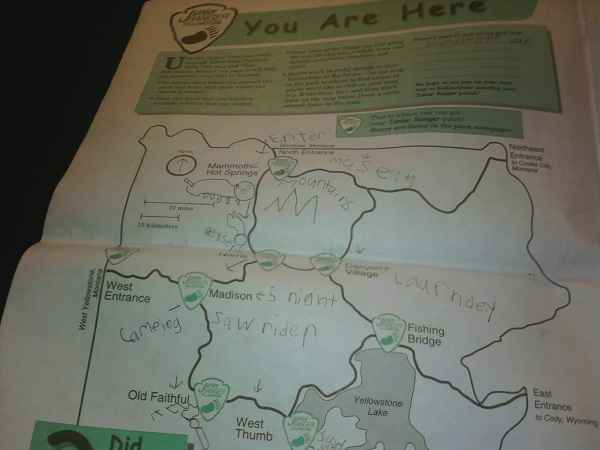 The National Parks are all different however, some you have to buy the Ranger book such as Yellowstone National Park the kids Junior Ranger Activity Paper was $3.00, and others they were cheaper and at some they were free. Each of the Ranger Activity Books or papers depending on where you were some were newspapers, some were like magazines or books have different activities in them. The Yellowstone Junior Ranger Activity Paper was 12 pages long, the first page has write ups on becoming a Yellowstone Junior Ranger, and a brief write up on Yellowstone National Park. Page 2 was a You Are Here page with a map the kids had to fill in there is a picture of that at the bottom of this post along with other pictures. Page 3 was a Your Yellowstone Journal page, where the kids had to write what kind of animal in the park would you want to be and why, If you were a Ranger what would be your favorite part of the job and why, Describe one thing that happened on your trip through Yellowstone that you want to remember forever, and last they had to draw a picture of their favorite Yellowstone place, animal or flower. Page 4 was about the ecosystem and a word search of things in Yellowstone. The theme of the paper was that way all the way through, with activities, educational information and more. 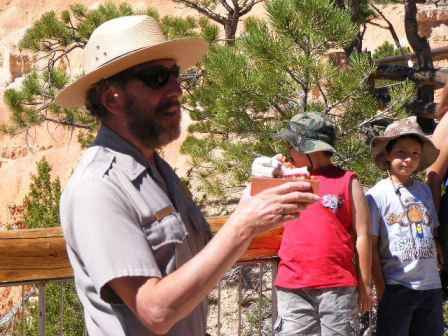 Also part of the activities included answering questions on different topics, going to certain areas of the park and viewing an exhibit and answering questions on it. You usually had to go to at least one Ranger Program or talk also in order to earn your badge. Looking at my son's paper because I can't remember, some things he did was, Attended the Bears Gone Wild Talk and it was signed and dated by the Park Ranger that gave the talk, he Visited the Mammoth Visitor Center and wrote what he learned there. For his take a walk on any self guiding or other park trail we did the Old Faithful Trail, He went to the Albright Visitor Center at Mammoth Hot Springs and answered the question for that stop, He did the Canyon Visitor Center and answered the question for that stop too. 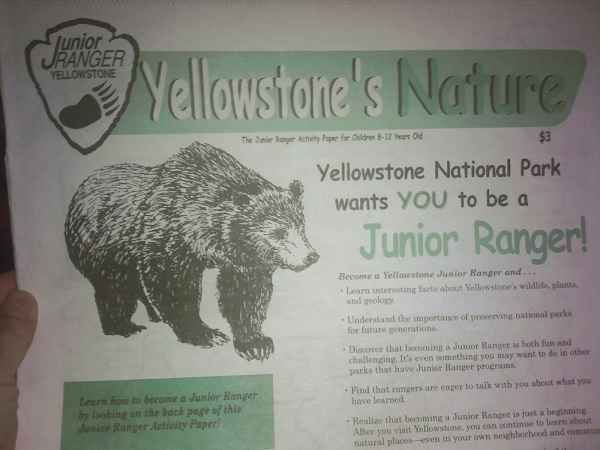 The instructions on the last page are: Complete all of the requirement listed on this page to become a Yellowstone National Park Junior Ranger. After finishing all the required activities, that this newspaper to one of the park visitor centers or other locations shown on page 2. 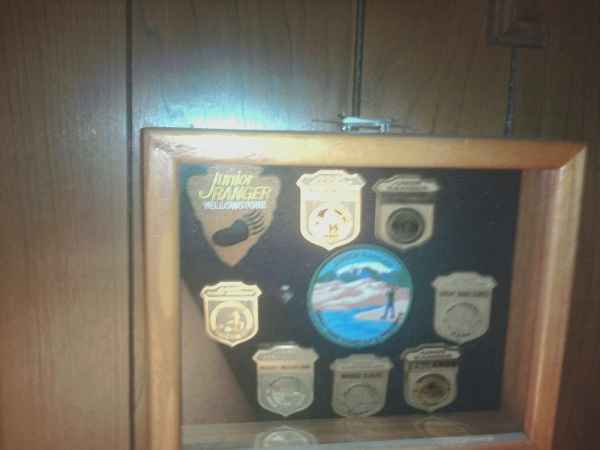 A ranger will award you your Junior Ranger Patch. Different requirements are explained for different ages, for the 10 to 12 year olds they had to complete all the answers on the last page plus at least six other activities. Each activity had to be signed off by a parent or adult, and the Ranger talk had to be signed off by a park ranger. 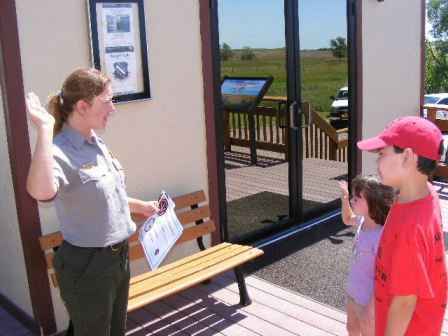 When all activities were done, we took the kids to the Park visitor center and up to the Ranger Station inside, they gave their books to the park ranger, who would check their answers, and they would work together to correct the ones that weren't right. The park ranger would usually ask other stuff of the kids more informal in nature. Then he would sign the book or paper, and have the kids raise their right hands, then he would swear them in as Jr Park Rangers. We have a few shadow boxes made for the kids and we need more shadow boxes, we've even done a few parks more than once, and the kids noticed some badges are doubles, and they have even noticed some badges have changed a little from year to year. It's fun watching them get their badges, collecting them, taking their Ranger Oaths, they have such a sense of accomplishment, and they should, they work very hard to get them, but they have fun and learn a lot about many things during the process. Some of the National Parks the kids have badges or patches from are: Yellowstone National Park, Grand Teton National Park, Bryce Canyon National Park, Badlands National Park, Devils Tower National Monument, Minuteman Missile National Historic Site, Eisenhower National Historic Site (Junior Secret Service Star Badge), Great Sand Dunes, Wind Cave National Park, Carlsbad Caverns National Park, Mammoth Cave National Park, Mesa Verde, Rocky Mountain National Park, and one from Antelope Island State Park which is in Utah near Salt Lake City. We hit Zion National Park but didn't stay long enough to get a badge there, and Arches National Park, and Grand Canyon National Park were visited a few years ago. They have a few doubles as well. Junior Rangers getting sworn in.